First of all, there’s the sheer size of the thing. It’s a 14-foot-tall, three-dimensional head. And it’s covered in 3,000 LED panels, populated by 850,000 LED lights. This is the ultimate way to take a selfie. A 14-foot sculpture displays a larger-than-life image of your face. It is located in the Greater Columbus Convention Center, Columbus Ohio. Here's how to take a giant selfie. Quando il monumento diventa… interattivo! Per i più fortunati che trascorrono le vacanze invernali negli Stati Uniti, è imprescindibile fare tappa nello stato dell’Ohio, per sperimentare – mettendoci letteralmente la faccia – l’ultima opera dell’artista locale Matthew Mohr. Da alcune settimane, all’interno del Greater Columbus Convention Center, a Columbus, chiunque lo desideri può infatti temporaneamente protagonista del progetto artistico As We Are. Za projektem ”As We Are” (”Tacy, jacy jesteśmy”) stoi artysta Matthew Mohr. Jego wyjątkowa trójwymiarowa interaktywna rzeźba w kształcie ludzkiej głowy wyświetla odpowiednio zmapowane selfie. Jeśli chcielibyście zwizualizować sobie jak by wyglądała wielka statua z waszym wizerunkiem, zdecydowanie powinniście tego spróbować. As We Are (comme nous sommes) est une sculpture interactive de 4,2 mètres de haut de l’artiste Matthew Mohr. 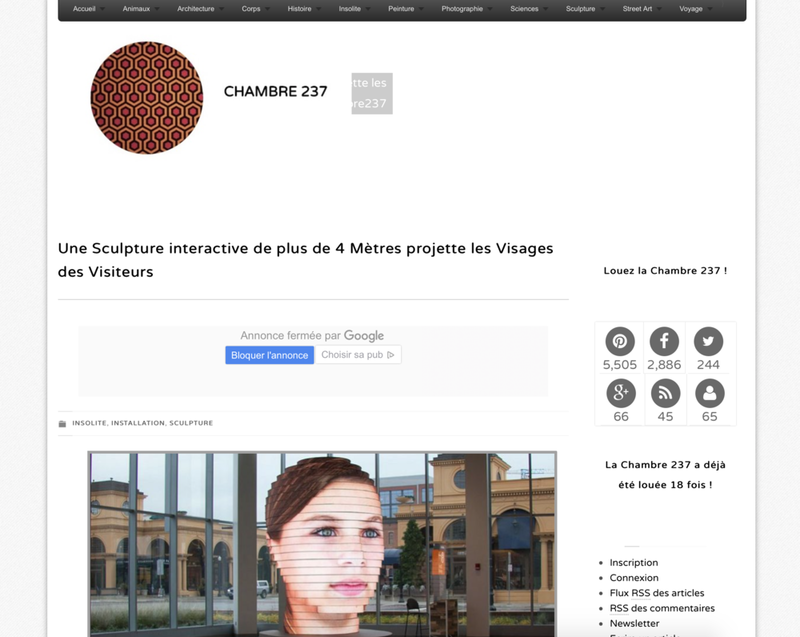 L’oeuvre en forme de tête expose lentement et alternativement, grâce à une base de données, les visages de résidents de Columbus et de ses visiteurs sur 24 bandes horizontales d’écrans LED. Ever since Apple introduced the front-facing camera in 2010, selfies have become the undisputed king of social media. The incessant need to share breathtaking self-portraits on popular mobile photo services like Instagram and Snapchat has often proved to be dangerous and, in some cases, even deadly. Fortunately, that will not be the case for those using a new art installation in Columbus, Ohio, which transforms an ordinary phone selfie into a 14-feet-high 3D sculpture, which can be admired by all. The smartphone revolution has put incredibly powerful devices into the pockets of millions and millions of people, and that’s great, but it also gave birth the selfie craze. If you’re not taking photos of your own mug at least a couple of times every day you’re probably in the minority, but what if you’re a seasoned selfie snapper who really wants to take things to the next level? In that case you’re probably going to want to visit the Greater Columbus Convention Center, where a new interactive sculpture is turning the faces of everyday people into huge works of art. 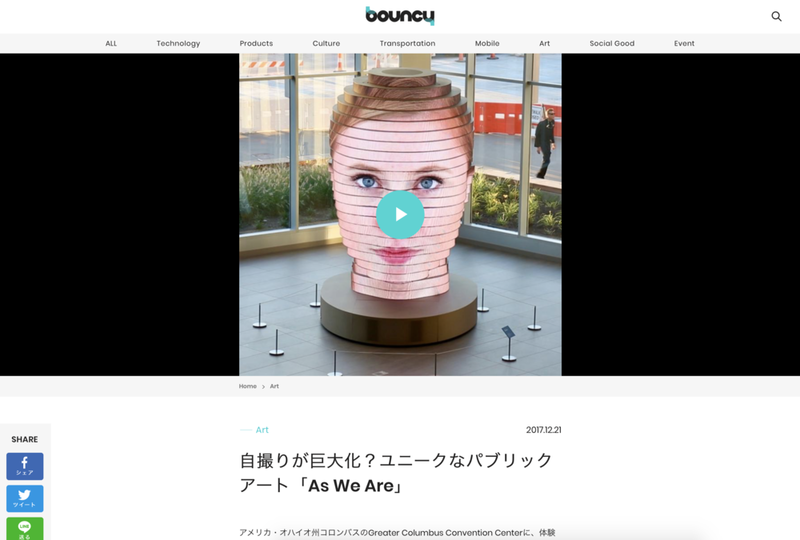 permanently installed in the greater columbus convention center, columbus, ohio, ‘as we are’ is the first of its kind but others can be installed anywhere else in the world. the sculpture is a fourteen-foot, 3d universal human head made from ribbons of ultra-bright, LED screens. 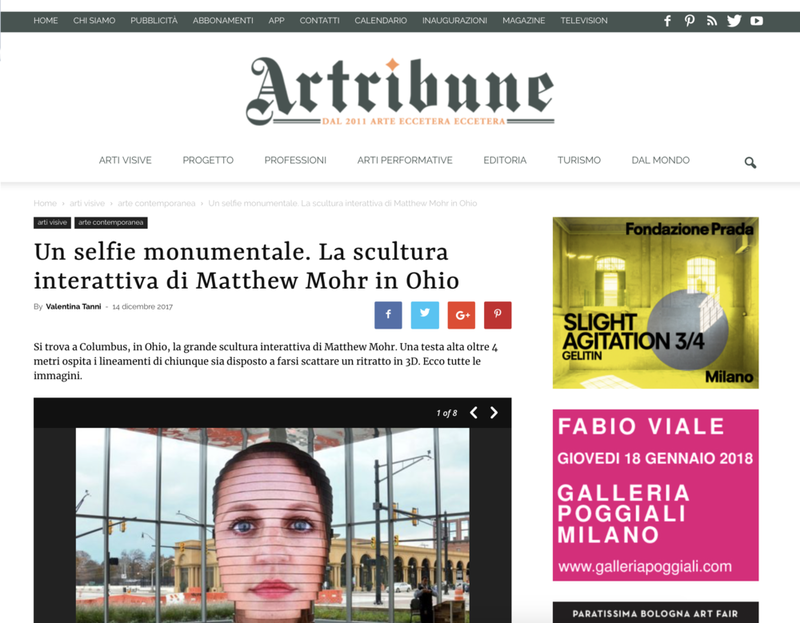 Si trova a Columbus, in Ohio, la grande scultura interattiva di Matthew Mohr. Una testa alta oltre 4 metri ospita i lineamenti di chiunque sia disposto a farsi scattare un ritratto in 3D. Ecco tutte le immagini. Se montrer, s’afficher, s’exposer… L’image de soi a pris une place tellement prépondérante dans notre société que cet artiste, répondant au nom de Matthew Mohr, a décidé de transformer nos selfies en véritable sculpture en 3D. Impressionnant… mais angoissant. Artist and physicist Matthew Mohr has created “As We Are” an amazing interactive sculpture of a 14 foot human head made of LED screen ribbons that contains a photo booth located behind in its neck. A unique interactive installation has been unveiled in Columbus, Ohio that enables visitors to create a gigantic digital sculpture of their own heads. Created by Design Communications Limited along with local artist Matthew Mohr and The Greater Columbus Center, “As We Are”, utilizes a 32-camera 3D photo booth and 850,000 individual LEDs in order to generate a dramatic likeness of guests that get their images taken inside it. Using custom facial recognition software and a process called photogrammetry, synchronized cameras inside the structure capture a person’s portrait and custom software stitches the separate photos back together to display across the surface of the sculpture. Artist Matthew Mohr has created a 4-meter high sculpture that projects a lifelike image of people's faces. He wants viewers to question the phenomena of social media. Seeing what your face looks like 14 feet tall and enlarged hundreds of times in a public forum might sound like a nightmare to some people, but to others, it’s a fun way to interact with other visitors at the Greater Columbus Convention Center in Columbus, Ohio. ‘As We Are’ is a permanent sculptural installation made of 23 ribbons of LED screens wrapping around a vaguely head-shaped base on a podium. Walk around to the back, and you’ll find the entrance to a photo booth inside.